Every week for the past few months, I have participated in a weekly blog series called Thursday Movie Picks. A certain theme, or category, is thrown down, and movie bloggers around the world make a list of three picks that fit that theme. Last week's theme was Live-Action Fairy Tale Adaptations. I struggled. I honestly can't remember seeing one, especially one of the traditional ones, like say, "Cinderella." I haven't seen the 1950 Disney Animated “Cinderella” in years, but I do know that screenwriter Chris Weitz ("About a Boy", "The Golden Compass") has done an incredible job of updating and fully enriching this already well-known fairy tale. The story is pretty much the same one we all know. A young, animal-loving, blond girl with curls named Ella (Lily James) comes of age with a loving mother (Hayley Attwell) and an equally loving, yet often traveling, merchant father (Ben Chaplin) in a story book version of 17th century Europe. 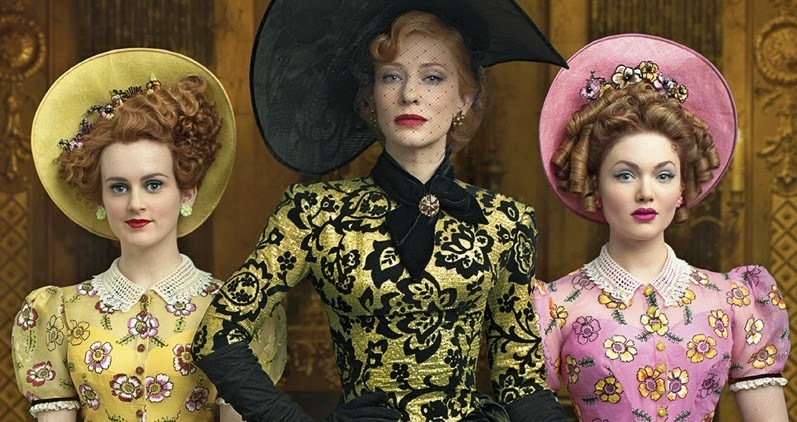 She loses her mother, her father remarries, then she loses her father and is left with a domineering, mean-spirited Stepmother (Cate Blanchett) and two dim-witted, materialistic step sisters, Drisella (Sophie McShera) and Anastasia (Holliday Grainger). Poor "Cinder"Ella is effectively banished to the attic and made to do all the chores. The best of this movie is in the familiars of the original Disney classic wonderfully sprinkled into a fully realized live-action movie. There is just so much more here than I've ever seen of this story. In a masterstroke of storytelling, we get the one thing we were missing with previous versions. We get to know the Prince (Richard Madden). Wisely, this movie knows that there needs to be more in the development of the male characters. First, the father character is more prominently featured than before. His love for his daughter shines through clearly and easily. Second, the Prince actually gets a full arc here. Played to perfection by the handsome British actor, Richard Madden, most well known as Rob Stark in HBO's "Game of Thrones," has a light in his eyes and a desire for true love that matches the kindness in Lily James' Ella. Pretty blue eyes almost play a role in this movie. In fact, the color blue itself is huge here. We get to know the Prince as a real guy, just a dude named Kit, who wants to fall in love for real and not have his wife picked for him. Finally, there is a bonus villain here in the Grand Duke, played by veteran actor Stellan Skarsgård, who wants the Prince to marry for advantage, to strengthen his own role in the kingdom. In the midst of all the new additions in character development is the stuff we know: the mice and their cheese crumbs, the fire and ash that gives Ella the "Cinder" prefix, the ball, the glass slipper, the stroke of midnight, the search for the fitting foot, and, finally, the Fairy Godmother (Helena Bonham Carter), who does the classic magical routine with the mice and the pumpkin and the tattered dress to get this beauty to her destiny. Helena Bonham Carter, who also narrates, owns in her brief appearance. She herself is magical. And the special effects in her sequence are flawless and fun. 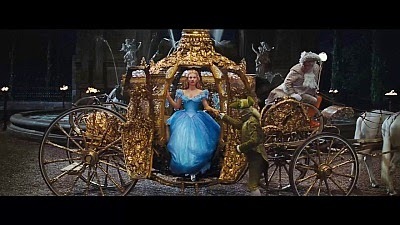 Director Kenneth Branagh's vision of the timeless fairy tale is vivid and colorful. He clearly knows what he's doing being no stranger to brilliant period pieces, like the 1996 line-for-line adaptation of Shakespeare's "Hamlet" and, most recently, special effects action flicks, "Thor" (2011) and "Jack Ryan: Shadow Recruit" (2013). Branagh's eye for detail and color and eyes! and visual spectacle is perfect for this story. He visually works the smallest of details and then offers huge sweeping shots of beautiful palaces and village market places and not-too distant mountains. 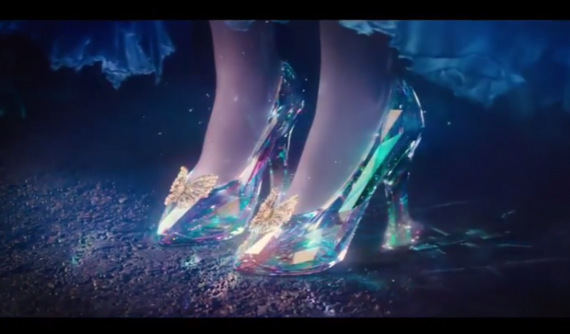 "Cinderella" is pure eye candy with great performances from lead Lily James ("Downton Abbey"), so sweet and beautiful, and Cate Blanchett, who I've not yet praised because she is simply so convincingly evil that I am still sort of mad at her. And, while this sort of movie isn't really for me (and my particular tastes), I left the theater supremely satisfied with a “family” film I just wasn’t sure I’d enjoy. For Ella listened to her mother, who told her “Have courage, and be kind.” And the makers of this movie seemed to follow this advice as well. In a day and age where young people are blasted with technology and the reality trash on TV, this movie is simple, yet elegant, totally wholesome, and courageous in its kindness. By the way, a short ran before the feature. "Frozen Fever," in which Elsa plans Anna's birthday party while coming down with a cold, is cute but totally forgettable. It might as well be called "Frozen: The Music Video." I hear ya! I would so rather read subtitles than see a dubbed movie. This really is a good movie. Just beautiful. Hopefully, you can find a suitable version soon.